This fand designed especially for heavy domestic, commercial and industrial applications, this sturdy yet portable fan provides continuous high flow air movement for ventilation or cooling. 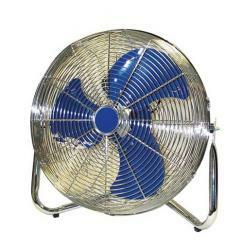 18" fully enclosed, 3 blade high velocity impellor. 232 watt, 230v motor with 3 speed control. Durable all-steel construction with attractive chrome finish. Swivel body for angle adjustment.